The summer sun is beating down on us like a bawse, and the humidity levels are through the roof. On top of everyone’s mind are tall, icy-cold glasses of refreshing drinks. Here’s a list of summer coolers that’ll help you beat the heat and quench your thirst. It’s known to all that kokum is a natural body coolant. Keep your cool this summer with Coastal Macha’s Kokum Sherbat made with kokum juice and topped with pepper, cumin and rock salt (INR 70). Kolkata’s best known place for sherbets and syrups, Paramount has been quenching our thirst since our childhood days (and even our parent’s). The one that always wins our heart is of course their Daab Sherbet. Made with tender coconut water and full of tender coconut flesh this one is pure heaven. Nothing can light up midsummer’s dreams like lemonade can, and things get more exciting when exotic flavours are added to it. The Yellow Straw’s Lemongrass Cooler is lemonade with a twist with a touch of spices and lemongrass leaves. What can be more potent than yogurt to beat the heat? Head to Juices And More to try their Mango Lassi (INR 160) – it has delish mango pulp and is topped with mango chunks! Drool alert! Our go-to tea shop that never gets old and never too tiny to fit in, Dolly’s tea concoctions are a cool way to beat the heat. 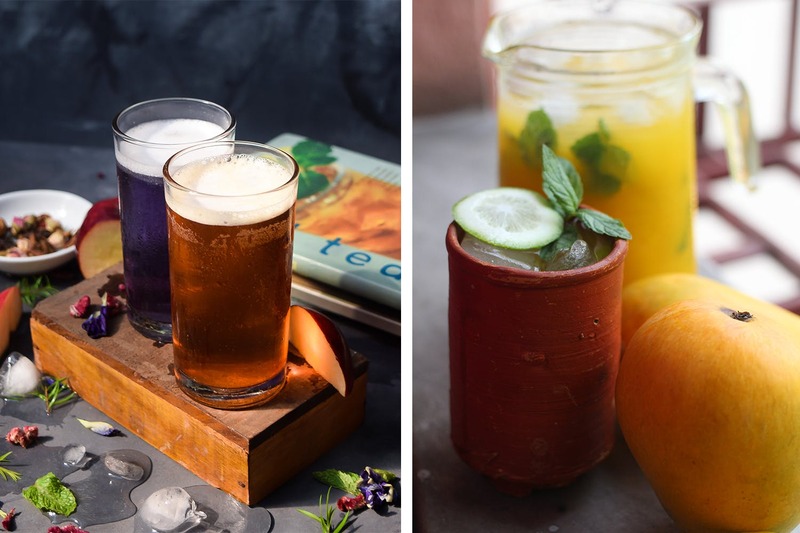 There are of course plenty choices to spoil you rotten, but we love her spicy and refreshing Iced Green Ginger and the tangy orange and mint julep. Both of these are priced at INR 70. The Drunken Monkey has been romping around our town for some time now with its fresh pressed juiced and smoothies. Try the Summertime Madness – it has watermelon, pineapple and green grapes juice and comes loaded with fruit chunks. Priced at INR 159, this one is as good as a meal, tbh. Our love for gondhoraj goes way long back before fancy flavours came to our town, and it’s no confession to make that nothing comes close to its refreshing citrusy flavour to help us beat summer. Bohemian’s Gondhoraj Julep that comes topped with coriander leaves is one such thing that we can’t get enough of. Keep cool and drink lemonade! The Byloom Canteen is another place that’s keeping us ready to tackle the heat and enjoy the occasional kalboisakhi. With the stormy rain showers brewing almost every evening this season, Byloom Canteen’s Shilabrishti (named for the hailstorms that happen in Bengal) is perfect to sip on and enjoy the weather. Made of amla and ginger, Shilabrishti is priced at a pocket-friendly INR 80. Their fine Darjeeling tea and delicious cold cuts keep taking us back to Whistling Kettle. But with the summer heat leaping up by degrees, try the summer-fruit inspired Grape Pine Berry Cooler. Made with black and green grapes, pineapples and strawberry crush this one is seriously high on taste and vitamins. Some of us might cringe, but there’s a whole lotta others who swear by the taste of Balwant’s Doodh Cola that blends the zing of cola fizz with the smooth creamy texture of milk. Best drank out of an earthen cup, jugs of 500ml Doodh Cola are available for INR 150. Karma Kettle’s beautiful tea room and a collection of exotic teas make a tea lover out of every one of us. While their hot teas are certainly a thing to savour, their cold teas are amazingly refreshing and yummy. One of them that we absolutely love is the gorgeously scarlet Tahiti tea that is made of hibiscus and coxcombe and has fruity flavour of strawberry. Another refreshingly tasty cool summer tea that you must definitely try is Eat Good Food’s Iced Apple and Cinnamon Tea. Infused with cinnamon, the tea has a burst of flavours and comes topped with chopped apples. A potent digestive power packed with anti-oxidants and natural body coolants, Paranthe Wali Galli’s Gur Shikanji will surely keep you fit for summer. A mix of jiggery, rock salt, lemon and gondhoraj this one is made to drink in repeats. Keeping all fancy aside, let’s really just go back to the basics with Raj’s Spanish Café because their watermelon cooler is made to quench every summer thirst.